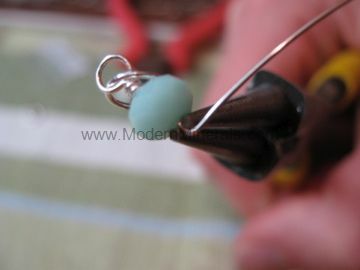 I actually wrote this post as I was making the charm necklace. I’ve been having serious trouble with my editor though. It seems the more photos I have, the harder it is to make a post come together. It has been a great source of frustration for me. Unfortunately, once I get frustrated and step away it can take me a while to get back to it. So, today I made a point of fixing this so that I could get it posted. I finished my beaded ring and I hope to have that one up tomorrow. The class was a ton of fun. I had purchased two kits, so the man came with me. He made his ring for my daughter and he did a fabulous job. We had to guess on her size and it came up a bit too small. I want to post photos of both, so we need to sit down and figure out how to redo the shank of the ring without having to do the whole thing over. It should be fun. 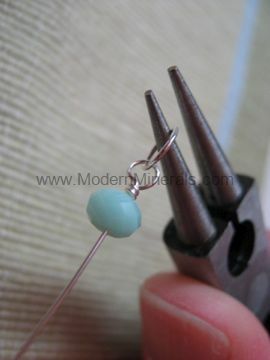 And now for the long overdue post on how to make a wrapped wire loop. For this project I am using 24 guage, half hard, sterling silver wire. 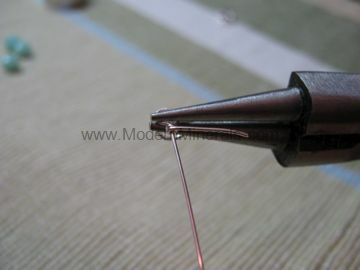 If you are working with a long piece of wire you will want to start by threading on your bead. I just finished a necklace and I put all of the beads necessary on to the wire coil prior to starting. I put a small bend in the other end of the wire to keep them from falling off. To start making the loop you want to get a nice sharp 90 degree bend in the wire. I’ll be wrapping the wire around the the wire to give it added security. 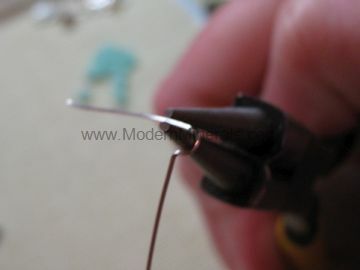 I’ve done this a couple of times and silver is expensive so I only bend about two inches of wire over. 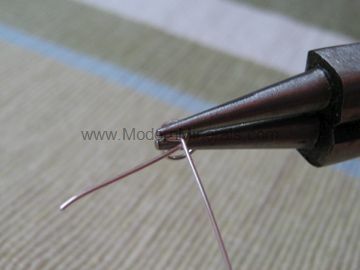 IF this is your first time doing it, I highly suggest you practice with craft wire until you become more comfortable Also, give yourself a little bit more length to work with. Take the wire and hold it so that the short end is bent in towards you. 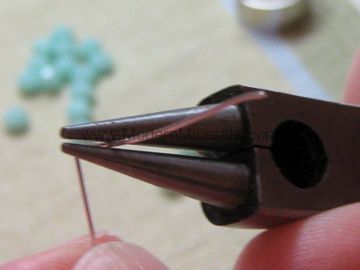 Take the round nose pliers and grasp the wire about a quarter inch in from the bend. Roll the pliers up and away from you. Imagine that the loop is complete. Stop when the loop is centered over the stem wire. If you keep going you will lose that 90 degree angle that you made, and you don’t want to do that. 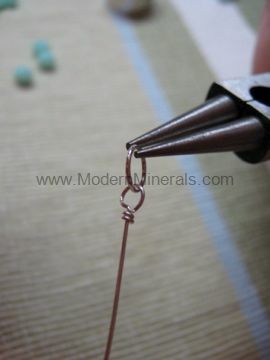 Grasp the tail end of the wire and draw it snugly around the pliers so that you complete the loop. At this point I generally slip the pliers out and take a peek to make sure every thing is lining up and that the loop is straight. This is the first link in a chain that I am making. I need to attach the chain to my clasp. I’m using a lobster claw clasp with a large jump ring. In this photo I have slipped the jump ring in to my loop. If I were attaching it to a loop that was already made, I would slip in the loop that I am attaching the new link to. 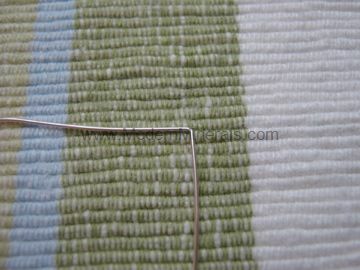 Carefully grasp the loop with your pliers to hold it steady. Take the tail wire and wrap it snugly around the stem wire. I am using half hard wire so i was able to do this fairly easily with my fingers. You can also grasp the end of the tail wire with another set of pliers. 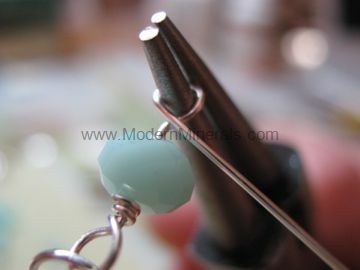 I find that this sometimes help me get a better grip when I am using stiffer wire. 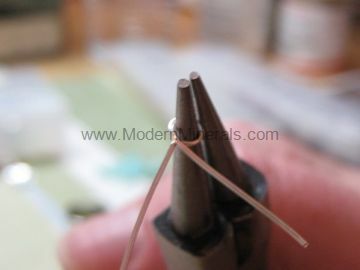 Once you wrap the wire around it a couple of times you will cut the tail wire off as close as you can get it. BE careful though, you don’t want to cut the finished loop! 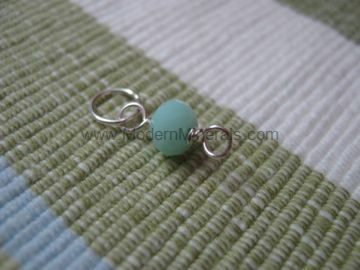 One finished wire wrapped loop, attached to a jump ring. Half way there! Add your bead. Mine were already on the wire, so I just slid one up. From this point, you are going to make the loop just like you did on the other end. 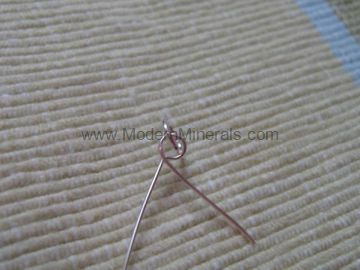 Grasp the wire with the pliers about a quarter inch from the bend and roll the wire up and away from you. make sure you stop when the loop is half completed and is centered over the stem wire. Finish it off, just like you did on the other end. 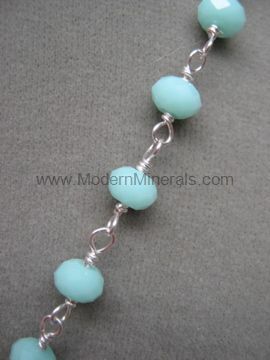 Continue along making wire wrapped loops and in no time at all you will have a pretty little beaded chain.